I was driving across the state to meet up with Tom and Brian for some last fun in the desert before seasonal temperatures there would get too warm. I had spent the night on the east side of Walker Pass, not far from the junction of SR14 & SR178, parked atop the concrete roof of the LA aqueduct that ran underfoot. It was far enough from any highway noise but high winds swept across the Southern Sierra, rocking the van most night. Comfortably ensconsed in the back of the van and smug in knowing I wasn't getting battered outside in a tent, the sounds and motions were actually quite pleasant and I slept well. In the morning I ate breakfast as I drove north on SR14 to Nine Mile Canyon to tackle a collection of summits on the north side of this road connecting Kennedy Meadows to the Mojave Desert. The five summits, none of them named, were not conveniently located for connecting them nicely. Consequently, I would gain more than 7,000ft of elevation over the course of 8mi as I traversed from Nine Mile Canyon north across Deadfoot and Five Mile Canyons, then reversing directions, once again crossing these same canyons at a lower elevation. 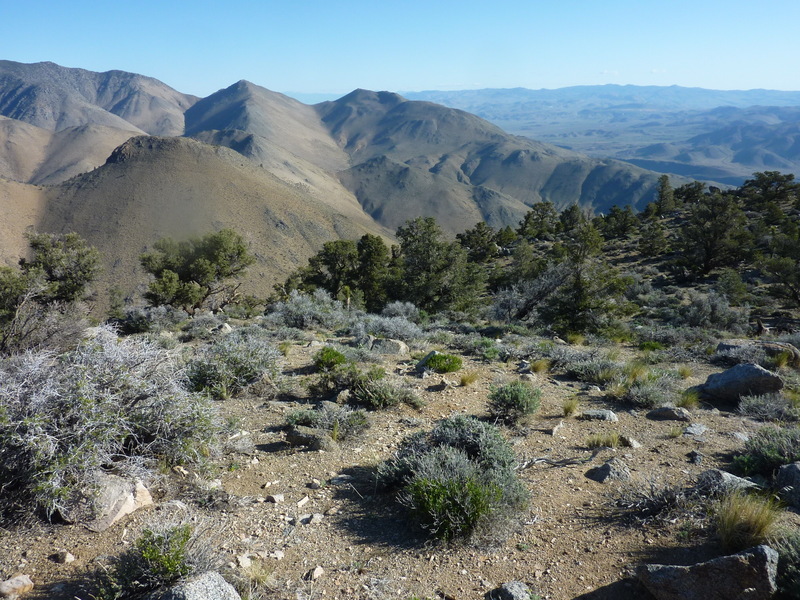 Like most of the summits on the eastern escarpment of the Southern Sierra, the terrain is only lightly vegetated but has a preponderance of sand and gravel, making for tedious ascents and fast descents. I parked on the north side of a bend in the road just below 4,000ft at the foot of the day's first and last peaks and set out around 7:15a. The first leg would climb to the day's highest summit, gaining more than 2,400ft in just over a mile, one heckuva steep climb - good thing my legs were fresh. With the somewhat loose slopes, it took me a little over an hour to make my way to the summit. Someone had left a collection of rocks at the top that had become a nesting site for rodents over the years, but no register. Not all that surprisingly, none of these five summits would have one. I next turned my attention north to the second highest, Peak 6,086ft directly across Deadfoot Canyon another mile. 1,500ft down, 1,200ft up, the effort would consume another 70min as well. It was not long after 9:30a when I reached the second summit and I was feeling quite good. The sand was not as bad as some of the other outings in the area and the wildflowers, though not plentiful, provided some visual distractions that would occupy my attention whenever I found a nice sampling. The howling winds during the night had died down some but were still strong, keeping the hike cool and rather pleasant. I had originally thought I would just do a four-peak loop, but since it was so early in the day still, I decided to continue heading north, next dropping down into Five Mile Canyon. The effort was remarkably like the previous one, just over a mile, dropping 1,500ft before climbing back up to summit #3, Peak 5,282ft. Unlike Deadfoot Canyon, Five Mile Canyon had water flowing in it, somewhat surprising for late April. The brush wasn't thick where I crossed, making for a trivial exercise. Despite the fact that I had a GPSr with all the summits precisely located, I climbed to the wrong point, reaching Pt. 5,838ft, half a mile west of my intended target. Oops - that's what I get for not paying attention to things. The extra effort included another 500ft of elevation gain I didn't intend, but it was not all for naught. Despite it's low prominence of 200ft which disqualifies it from LoJ, it is found on PB, I later found. It seems Jonathan Mason had made a two-day loop around Five Mile Canyon back in January and added a handful of summits to PB, including this one. I turned east and headed to Peak 5,282ft, an easy feat without a major canyon to cross, just a drop to a saddle followed by a 300-foot climb to the summit. I enjoyed more flower displays as I descended back into Five Mile Canyon for a second time, now heading south. Next up was Peak 5,585ft, the most prominent of the summits with more than 750ft of prominence. It was the largest of two remaining climbs, gaining 1,500ft from the creekbed. Reaching the top around 12:20p, I could just make out a section of Nine Mile Canyon Rd to the south. It would take another hour to cross Deadfoot Canyon to reach the last summit, Peak 4,860ft, finishing the last climb of this outing, a more forgiving 900-foot effort. On the way back down to the pavement in Nine Mile Canyon I came across slopes covered in small, yellow poppies, making for a brightly colored scene. This last descent went quickly over sandy slopes, getting me back by 1:40p, completing the circuit in about 7.5hrs. After driving back down to SR14, I visited Pearsonville to grab a Subway sandwich and a 44oz soda to help with rehydration. The combination worked wonders as I drove north towards Olancha and Death Valley, providing a boost to tackle a few more summits before calling it a day. 508 Peak is located immediately east of the junction of SR190 and Darwin Rd. I had visited the summit two years earlier with Karl, or thought I had. Only a week ago I had learned from John Kirk of LoJ that Richard Carey had visited the summit to find the NW summit higher with the help of a sight level. Karl and I had visited the SE summit and called it good. As luck would have it, I was planning to drive right by it on this desert trip so I stopped by for a second effort. This time I started from the pavement to the southwest, making use of an old mining road that passes by an open mine shaft and a few prospects before continuing cross-country up the steep SW slopes to the summit. The limestone made for good traction despite the broken nature of much of the rock. At the top I found the register Richard had left two weeks earlier. Curiously, Terry Flood had visited only two days after Richard. I looked over at the SE summit and could not tell which is higher, not surprising since Richard reported it only a foot lower. One of the first things I did when I got back from this trip was to order a sight level from an engineering supply place. This summit lies in the middle of the Santa Rosa Hills that separate Santa Rosa Flat from Lee Flat, easily seen on the drive north from SR190 along Saline Valley Rd. Having caught my attention, I stopped to pay it a visit. I turned off Saline Valley Rd at the unsigned junction with White Mountain Talc Rd, driving the latter about a mile and a quarter before parking less than a mile ENE of the summit. The roundtrip hike would take just over an hour. The ascent route was the most direct, following across Lee Flat before climbing steeply up (decent, but not great) limestone rock to the summit. I took a less direct route on the way back over gentler slopes that were more volcanic in nature and not quite as pleasant a route. Terry Flood had left a register here the previous December with a couple of pals. He had it labeled as the Santa Rosa Hills HP, but that's not correct - the true highpoint is about 4mi to the northwest and some 700ft higher, at least according to the labels on the topo map. Geez, you sure get around for a bay area boy. Peak 6,370 is my conditioning peak. Done it many times. I should have put a register there knowing someday you'd get there. Pretty good workout of 2,400 in just over a mile, no? I like being able to drive and park right off the pavement and this is the best, closest workout I could find to Ridgecrest with maximum gain and minimum distance with a sandy descent. I have a little 3 foot mound of dirt in the backyard of my house that I can still say I've climbed and Bob hasn't. What the heck, stop by and say Hi sometime and I'll let you climb it -- you deserve it oh supreme explorer one! Keep up the great work!